In 2004, Karl Rove declared that American liberals want to “understand our enemies.” In 2008, Sarah Palin declared that Barack Obama wants to “read terrorists their rights.” Both are not-very-veiled code for the perceived weakness and general softness of the left. 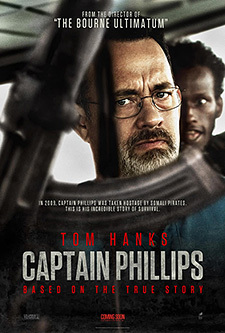 In “Captain Phillips,” directed by Paul Greengrass (“United 93”), written by Billy Ray (“Shattered Glass”), and starring Tom Hanks (you know), we come to understand, a little better, our enemy, the Somali pirates, one of whom is read his rights at the end. But there is no sign of weakness here. The opposite. The superorganized, superefficient, massive technological power of the United States of America—aircraft carriers, helicopters, superbuff Navy SEALS, superscope weaponry—is brought to bear on four skinny dudes on a raft. Yes, the Somalis have automatic weapons. Yes, they are holding our title character hostage. Yes, they are often unpleasant. Even so, the power discrepancy is so great, so absurd, I literally laughed out loud in the theater. Where’s the drama? There’s no drama. One side has everything, the other nothing. It’s such an unfair battle, you begin to wonder who to root for. The weight and power of the response almost seems to justify the crime. Paul Greengrass tends to make smart action movies about the collision of first and third world: “United 93,” “Green Zone,” “Bloody Sunday.” In these, he never fails to show us a bit of the other side. So with “Captain Phillips.” The movie opens in Underill, Vermont, in the quiet home of Capt. Richard Phillips (Hanks), who, in spring 2009, is prepping for his next assignment aboard the Maersk Alabama, which is moving hundreds of tons of cargo—food, fuel, water—from Oman to Kenya. Then he and his wife, Andrea (Catherine Keener), drive to the airport. They have a conversation that’s a bit freighted. It comes to us with quotes attached. The kids aren’t trying hard enough in school, he says. The world isn’t like the world they came up in, he says. It will be tougher. Fifty guys are competing for every job. There will be greater competition. CUT TO: Greater competition. Men in vans, with automatic weapons, pull up in a village in Somalia, and wonder why no one’s at sea. “The boss wants another ship today,” they say. Teams are picked. Sides are chosen. One team leader is hopped-up and wide-eyed. The other, Muse (Barkhad Abdi), casts cool, almost disdainful looks over the proceedings. He’s got a stillness to him. He says little and chooses carefully. At times he even like the emaciated younger brother of Omar from “The Wire.” In another movie, he’d be the hero. This is the collision that occurs: between two men doing their jobs. The crew hides. They power down the ship and claim it’s broken. Phillips plays innocent in the face of a semi-automatic. One pirate is nearly crippled by broken glass, another, Muse, is taken hostage. In the standoff, they offer the pirates $30K from the ship’s safe and a lifeboat, which looks a bit like the submarine from “Yellow Submarine.” The pirates take both and Capt. Phillips and head back to Somalia. And that’s when all the drama drains away. I’m not blaming the filmmakers for this, by the way. 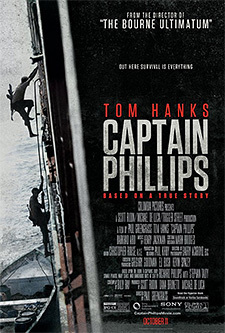 “Captain Phillips” is based upon a true story, or at least Captain Phillips’ account in “A Captain's Duty: Somali Pirates, Navy SEALS, and Dangerous Days at Sea,” written by Stephan Talty. The movie fudges some details from the book—apparently Phillips was on the lifeboat for five days, not a day and a half; and apparently he was beaten and mock executed after his attempted escape; and apparently he didn’t have a nervous breakdown after his rescue—but overall the movie strives for verisimilitude. No, I blame the U.S. defense budget. In 2012, according to the Stockholm International Peace Research Institute, the U.S. spent $682 billion on defense, which is $30 billion more than the defense budgets for the next 10 countries combined. Face to face, no one else has a chance. Put it this way: The Somali pirates in this movie got bested by unarmed slacker crewmembers and a 50-year-old man in a light blue polo shirt. What chance do they have against men who trained their entire professional lives for this? They don’t. Remember when the Dream Team—Michael Jordan, Magic Johnson, et al.—first showed up in the Olympics in 1992 and beat teams by like 75 points? It wasn’t a question of whether they would win, it was a question of by how much. Same here. You wonder how, not if, Capt. Phillips will be rescued. Here’s how. U.S. military technology identifies the pirates, the square-jawed negotiator then calls them by name and gets them to agree to be towed. They take Muse on board, ostensibly for negotiations, but there are no negotiations. Instead SEALS take out the three remaining pirates with simultaneous headshots—boom boom boom—and Muse is read his rights. He’s now serving 33 years in a federal penitentiary. Compare all of this with “Kapringen,” a 2012 Danish film about Somali pirates hijacking a Danish frigate, which was named best Danish film at the 2013 Bodil Awards. Without a military to come to the rescue, it becomes a matter of tense negotiations and threats and inevitable death. It’s about the toll taken and the lessons learned. What lessons are learned in “Captain Phillips”? Unarmed frigates should be armed? Sail 600 miles rather than 400 miles from the coast of Somalia? Keep a SEAL team on retainer, >as one doofus American posted on IMDb about “Kapringen”? Here’s the lesson I learned: The U.S. military is powerful enough to kill drama. It’s so powerful, the people it’s protecting don’t need to learn lessons. Which explains so much about the current state of the United States of America.